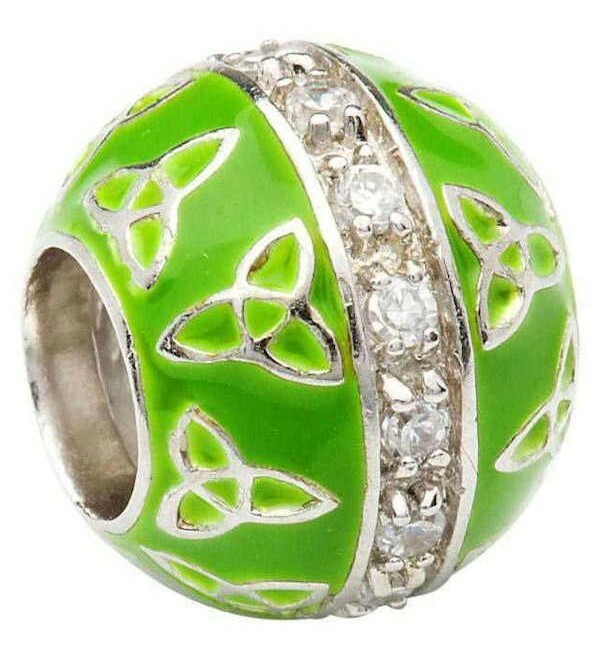 This charming bead will truly be an eye catching addition to your collection, especially if you need an eye-popping bit of Irish luck. This charming bead will truly be an eye catching addition to your collection, especially if you need an eye-popping bit of Irish luck. Though crafted of sterling silver, this delightful bead has been coated with a cheerful kelly green enamel. Over this enamel, a multitude of delicate Celtic Tri-cornered knots can be found. Alone, this would have made a pleasing and delightful diversion, but this bead has an extra bit of charm: the ring of cubic zirconia crystals creating a circumference around the bead that adds that necessary touch of sparkle and bling. The Celtic Tri-cornered Knot is one of the most endearing symbols in Irish lore. The never ending strand that is wove around itself in this motif represents a never ending love. Though originally this love was considered to be the love of the Holy Trinity, modern explanations allow every sort of love to fall under its domain. If your bracelet needs a splash of colour and design, this is the perfect bead for you. The bright green and sparkling crystals add a delightful touch of life to any project.